Comprehending the ramifications of the Spanish galleon (1565–1815) in the Pacific is vital for constructing more nuanced and balanced narratives of world history. Scholarship on colonialism in the American continents has long emphasized the outcomes of European contact on the economies, technologies, health, and cultural identities of its native populations. However, such research is rarely informed through comparison with Pacific Island societies that also engaged with—and were eventually colonized by—the Spanish. Provisioning the galleon ships that crossed the Pacific and sustained their religious mission fueled the economy of the Mariana Islands. This chapter integrates archaeological and documentary insights on the impact of Spanish colonialism in the Mariana Islands, an archipelago between Manila, Philippines and Acapulco, Mexico. This archipelago was a stepping stone for the Spanish galleon and its indigenous population, the Chamorro people, offering a unique and understudied example of early modern colonialism. We examine the material consequences of Spanish colonialism on Chamorro diet and food production, trade and political economy, labor and gender relations, and contemporary heritage and identity. Finally, we consider directions for future research on Spanish colonial-period archaeology in the Mariana Islands. Our participation in the June (6–7) 2013 workshop at the Universitat Pompeu Fabra, in Barcelona, Spain, was a catalyst for this chapter. 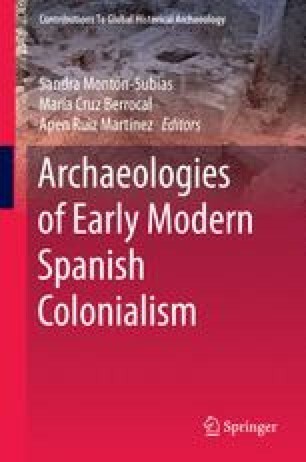 The workshop was co-organized by Sandra Montón-Subias, María Cruz Berrocal, and Apen Ruíz Martínez, and it was entitled ‘Archaeologies of Early Modern Spanish Colonialism.’ We offer our warmest thanks to the workshop organizers and coeditors of this volume. This chapter has benefitted from the ongoing interactions that we have had with our friends and colleagues in the Mariana Islands and elsewhere including (but not limited to) the following individuals: Andrea Jalandoni, Judith Amesbury, David Atienza, Omaira Brunal-Perry, Lon Bulgrin, Mike Carson, Alex Coello, Boyd Dixon, Majorie Driver, Doug Farrer, Hiro Kurashina, Rosanna Barcinas, Rosalind Hunter-Anderson, Carlos Madrid, Darlene Moore, Scott Russell, and Rebecca Stephenson. They have all improved and broadened our perspectives, but we are singularly responsible for any flaws in our reasoning and/or our use and interpretation of documentary and archaeological sources of information. Hezel, F. X. (2013). The early Spanish period in the Marianas, 1668–1698. Proceedings of the 2nd Marianas History Conference: One archipelago, many stories: integrating our narratives (pp. 127–136). Mangilao: Online publication of the Guampedia Foundation. http://issuu.com/guampedia/docs/mhc_history_bookpft?e=1294219/5887650. Accessed 13 Mar 2015. McKinnon, J. F., & Raupp, J. T. (2011). The potential for research on Spanish cultural heritage in the Commonwealth of the North Mariana Islands. Proceedings of the Asia-Pacific Regional Conference on underwater cultural heritage. In M. Staniforth, J. Craig, S. C. Jago-on, B. Orillaneda, & L. Lacsina (Eds.). Manila, Philippines. The MUA Collection. http://www.themua.org/collections/items/show/1198. Accessed 7 April 2015.